Reduced manual data entry by automating one off charges such as alarm attendances work orders. Automated and reconciled accounting data transfers. Relevant details provided on invoices. Consolidated site invoicing (multiple sites on one invoice). Temporary alarm billing and Work Order billing. Tight integration to accounting applications. 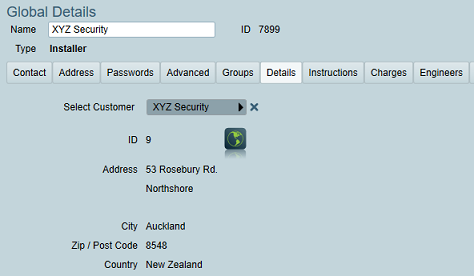 The Patriot CSV Accounting Module ensures all services are billed accurately and automatically and will connect to all major CSV accounting packages such as XERO or MYOB. Service charges (e.g. recurring monitoring entitlement charges) are assigned to clients on the client billing tab. Activation charges (e.g. alarm call out fees) are assigned to completed activations. Work Order charges (e.g. labour, parts etc.) are assigned to completed work orders. Once an activation or work order has been billed, it is marked as such in Patriot. The master charge value amount for any charge type can be overridden at either the dealer or client assignment level if necessary. You can bill a client directly for recurring service charges by assigning one or more master service charges on the client billing tab. You must choose a start and end date for each charge. Patriot's billing batch runs will only bill clients for a billing period if the billing period fits within these dates (part charging is supported). You may override the master charge value amount for individual clients if necessary. A single charge may be assigned to a current or completed activation. Billing status on the completed activation will read "Chargeable" if the activation belongs to a billed client (one who has a billing account no. set either directly on the client billing tab or via the dealer on the dealer details tab) and the activation charge has not yet been processed by a billing batch. After the charge is processed by the next periodic activation billing batch run the completed activation's billing status will read "Charged". Once an activation has been marked charged it cannot be billed again by subsequent activation billing batch runs. One or more charges may be assigned to a work order before or after it is has been completed. 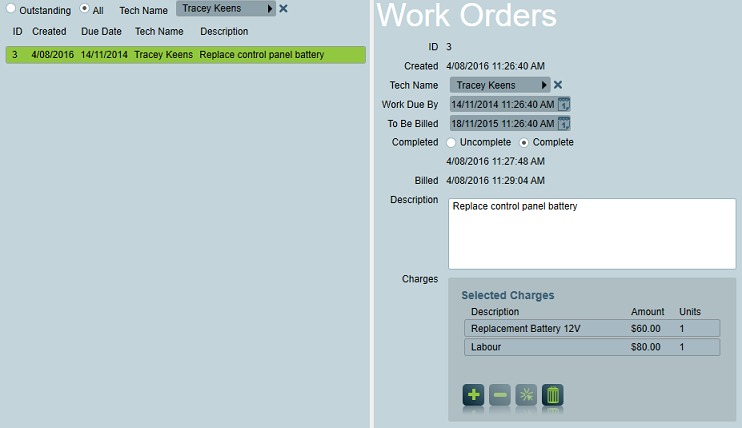 Billed status on the work order will be blank until the charge[s] have been processed by a billing batch. Work order charges, like Service and Activation charges, are only processed by billing batches if they belong to a billed client (one who has a billing account no. set either directly on the client billing tab or via the dealer on the dealer details tab). Usually a work order will also need to be marked as Completed before it can be billed, but this is configurable in the work order batch settings. After the charge is processed by the next periodic work order billing batch run (the first that occurs after the To Be Billed date) the completed work order will display the billed date. Once a work order has been marked with a billed date it cannot be billed again by subsequent work order billing batch runs. You can bill a dealer/installer for service charges assigned to clients belonging to that dealer. Whether a client with service charges assigned is billed directly or via a dealer is decided by the configuration of your billing batch runs. When billing dealers it is possible to override the value amount of each master service charge billed to each of a dealer's clients. This is achieved by inserting charge overrides on the dealer user's Charges tab. 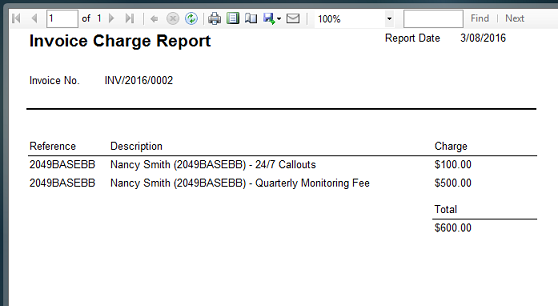 An Invoice Charge summary report can be printed for each invoice generated by a billing batch run. Charge summary reports can be automatically emailed to the invoice recipient such as a Bureau at the same time the invoice is sent to your accounting software for processing. 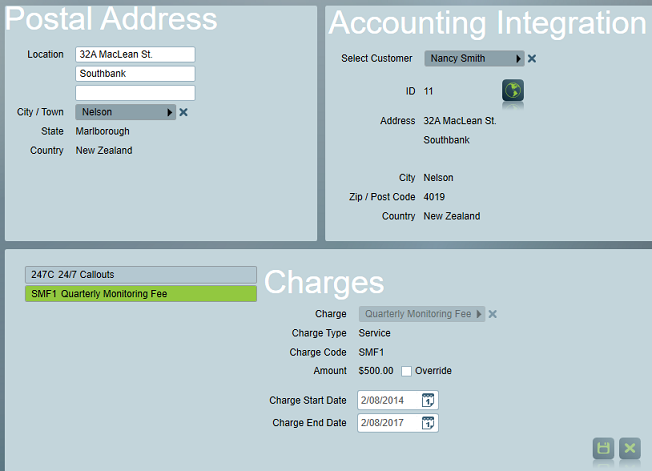 This is useful when billing large Bureau accounts - by enabling the Amalgamate Invoice Lines option and choosing an email output option you can send a single line invoice to your accounting software to produce a formal invoice, while at the same time a full charge break down is sent to the Bureau / dealer directly from Patriot. The Patriot Odoo module will allow PAtriot to interact with the Odoo SRM and manage sales and billing data between both packages. Clients created and changed in Odoo by accounts and sales teams are automatically generated and updated as clients in Patriot. 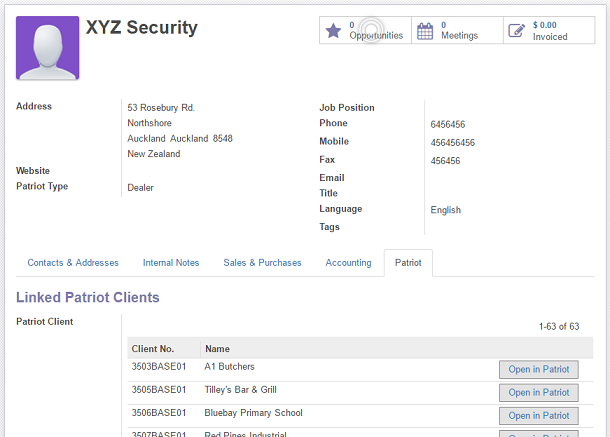 Dealers created in Odoo are linked to their associated clients from Patriot. Patriot Operators can generate work orders and these are automatically sent across to the Odoo Billing cycle. Alarm and Response costs from Patriot are automatically included in the Odoo billing cycles. Service and reoccurring costs from Patriot are automatically included in the Odoo billing cycles. Work orders and charges from Patriot are automatically included in the Odoo billing cycles. Sales inquiries entered in Patriot and transferred over to the Odoo Sales Leads. Odoo Operators can click on details in accounts and generate invoices which will automatically open the Client in Patriot.